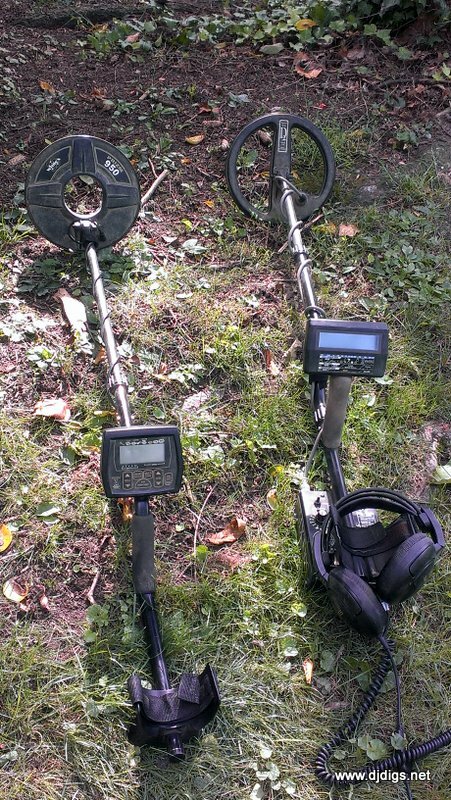 DJ Digs: Ten Silver Day! 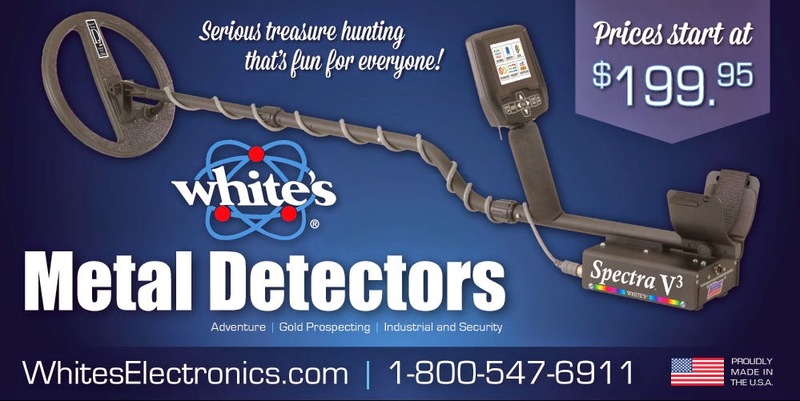 My new friend called the other day with great news - he'd lined up a few spots for us to detect! One of them was a site that I'd been dying to hunt but hadn't gotten the chance to stop and ask for permission. We met up today. I set him up with my Prizm V and off we went! 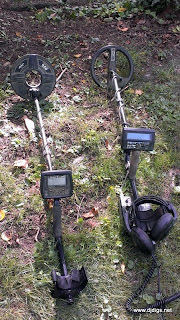 We started hunting around an original swingset that's been in the yard since the 50's. I'm not sure if we were too anxious, or it was too early in the morning, but we weren't getting too many signals. I really thought for sure that this area would be loaded with targets. I slowly worked my way around the house to the front yard. 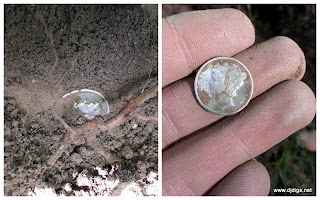 Within a few steps, I scored the first wheat penny of the day. a 1963 Rosie. The first silver of the day. 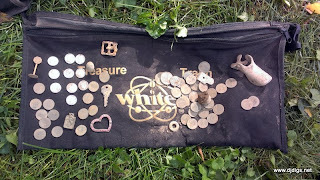 I stopped and called my friend to join me out front, so that hopefully he would find some silver coins as well. About a minute later, I got the same exact signal as before. I called my friend over and told him to check it out with the Prizm. I watched him dig his first ever silver coin, a 1947 Rosie. He was excited but I could tell that he didn't feel the find was rightfully his. Sure enough, he threw the dime back into my pouch and said, "Now I need to find one on my own." 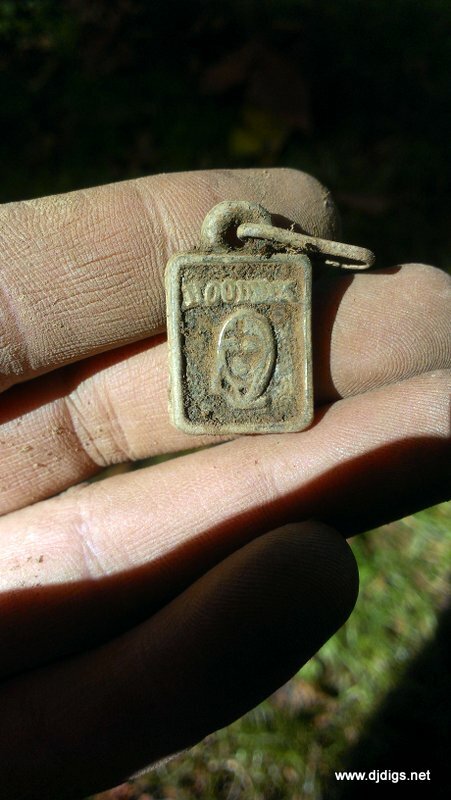 I told him it was his find, but he said to keep it - he wanted one of his own. I worked around the yard and dug a bunch of wheat pennies and a toy stop sign, which I believe is from a tootsie toy set). The next 3 targets were all silver Rosie's. 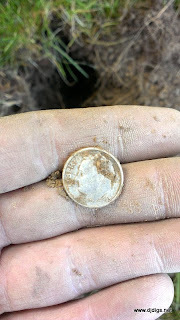 Then I dug a few more wheat pennies, a bunch of clad, and finally I got a silver dime that wasn't a Rosie! with the word HOODNIK on it. A quick search says it is a vintage cracker jack prize, made of copper. Around here, you'll find old bullets in front yards in residential neighborhoods. These two happened to be unfired. On the bottom, one says "Super-X 303 SAV" and the other says "SAV 303 SA Corp."
Finding bullets is always interesting to me, because in the old days, people could stand on their front lawn and shoot animals. We couldn't do that today without taking out a neighbor - today's houses are much closer together. This hunt was especially fun for me because my father used to play in this yard when he was a child. He even stopped by for a few minutes and watched me dig a few holes. 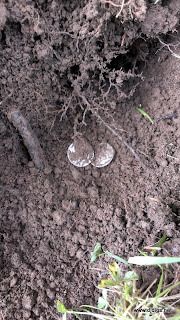 He was there as I dug my 7th silver and I told him how incredible it is to dig that many silver coins at one site. I said if I could get 3 more, it would be a 10 silver day - and I laughed because it is something that sounded amazingly unattainable. It would be awesome if it happened - but nothing like that has ever happened to me. It would be crazy! wheat pennies, so I really spent some time working this area. A few steps later, I got a solid 86 VDI number on my machine at 4-to-5 inches deep. I thought for sure it was going to be a silver quarter, but nope! It was a 2006 quarter. Boo. I mentioned before that it amazes me how a newer coin can be deeper than older coins on the same site. How is that possible? Ground variables are unpredictable. I decided to go back to the swingset where we originally started. In the zone now, I started getting the signals that I thought should have been there. Directly under the old swingset (I don't know how we missed it the first time) I dug an old toy cap gun. The homeowner watched me dig that hole and was so excited to tell me that it belonged to her son when he was a little boy! I worked that area for a little while longer, finding just a few more modern coins. and there were two silvers in one hole! I worked the area for a few more minutes before I came up with silver number TEN! Another Rosie. (and getting quite tired, to be honest) I checked to see how my friend was doing. As I was walking over to him, he looked up from digging a target and tossed me a coin, telling me to check out what he just found. I couldn't believe he found 1800's silver on his 2nd time out detecting ever, and using my old Prizm! 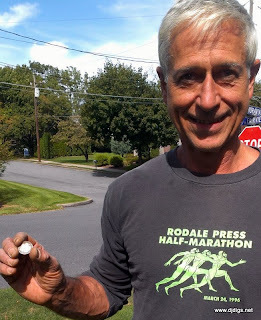 "I don't think I found a coin all day, and then I found THIS!" I explained what an awesome find that was and that I personally have only found a few of those coins in my entire career. After the excitement wore down, we searched the area for a little while longer and then called it a day. It was a great day on many levels. 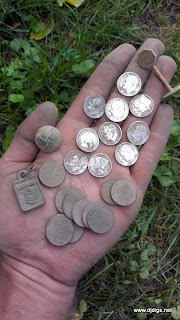 I still can't believe I found 10 silver coins on one site! Even the homeowner was surprised, though she did mention that her (late) husband hated carrying change in his pockets - LOL. 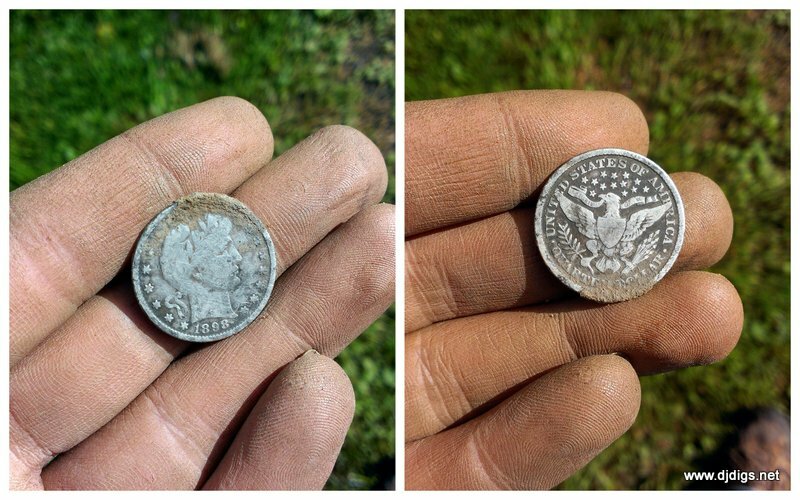 I got to experience my friend's first silver find - and then I got to see him find that 1898 Barber quarter. An awesome find for anyone, but incredible for a rookie! I've said it before, but I think it's so cool how this hobby can create friendships. 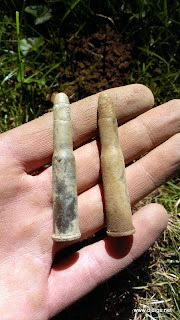 Today's dig was one to remember for both of us. Today, hunting together was better than going out solo. Not just a good day but a terrific day.... Envious. How totally cool, for both of you -- and the homeowner, too! How many hobbies give you win-win-win days all around like this one can? WOOHOO for y'all! Cobgrats! Heck of a haul!! Thanks Max! I was so happy he got that quarter! Heck of a find! I know what you mean Mary! I can't get enough of this hobby! Thanks!!! Thank you Mr Stout! Means a lot coming from you! I heard this is how it used to be years ago. I finally experienced it for myself. WOW! That is one for the books. I am so glad I have found this page. Great story.